A star remains a star only till his/her last on-screen appearance. The moment they bid adieu to the big screen, fate seems to take leave too. Be it super models roaming around the streets like a vagabond or veterans living in miserable conditions due to lack of money and work, there are numerous tales to narrate. One such name on the list is ‘Pakeezah’ star Geeta Kapoor. In a video, one can see Geeta Kapoor narrating her story as a junior artist. 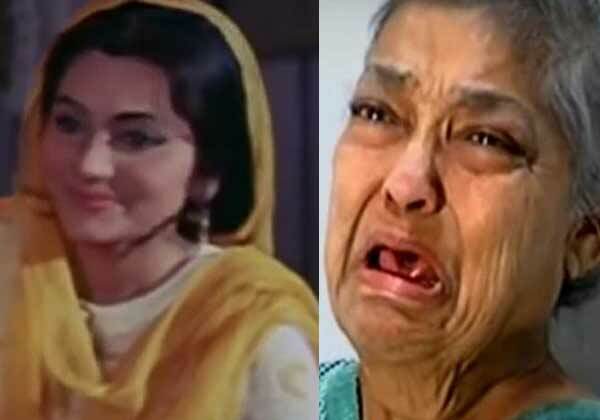 She worked in cult classic film Pakeezah starring Meena Kumari, Raaj Kumar and Ashok Kumar. Wiping her tears away, the old actress is seen telling her how it has been over a month that she has been in the hospital, but no one has come from her family to see or get her discharged. She did not suspect on son Raja when he got her admitted to the hospital on April 21. A report in Mid-Day says that the 58-year-old was admitted to SRV Hospital in Goregaon by her son Raja who abandoned her and fled. After failed attempts by the doctors to trace Raja and Pooja – the actress’ children, to inform them that their mother is now doing better and needs to be taken home after clearing all the bills, they have handed over the matter to the police. “He used to beat me up as I did not approve of his philandering ways. He would give me food once in four days, and sometimes, even lock me up for several days. I was not ready to go to an old-age home, that’s why, he planned all this. He deliberately kept me hungry and I fell ill. Then, he got me admitted and fled,” she said. “I even sent an ambulance to their home to trace him. But the neighbours said the family had left the house that very day,” he added. While her son didn’t turn up to take his mother home after being called repeatedly, daughter Pooja replied with a ‘wrong number’ and hung up. Since then, Geeta has been left abandoned at the hospital and the bill of her treatment has now reached to a sum of Rs 1.5 lakh. It’s been over a month and nobody from her family has come to get her discharged from the hospital. A Jagran report informs that producer Ramesh Taurani and Ashoke Pandit have come forward to pay her hospital bill. Though Taurani doesn’t know Geeta Kapoor personally, he has come forward to help on reading about it in the news. Reports suggest that the hospital has lodged a complaint with the police who are now trying to trace Geeta Kapoor’s family. It has also been reported that soon after admitting Geeta to the hospital, her son Raja moved out of their flat, which clearly hints that he’s been planning to abandon his mother for quite some time. Previous articleWatch: Kapil Sharma Takes A Sly Dig At His Mid-Air Fight With Sunil Grover In The Most Hilarious Way!